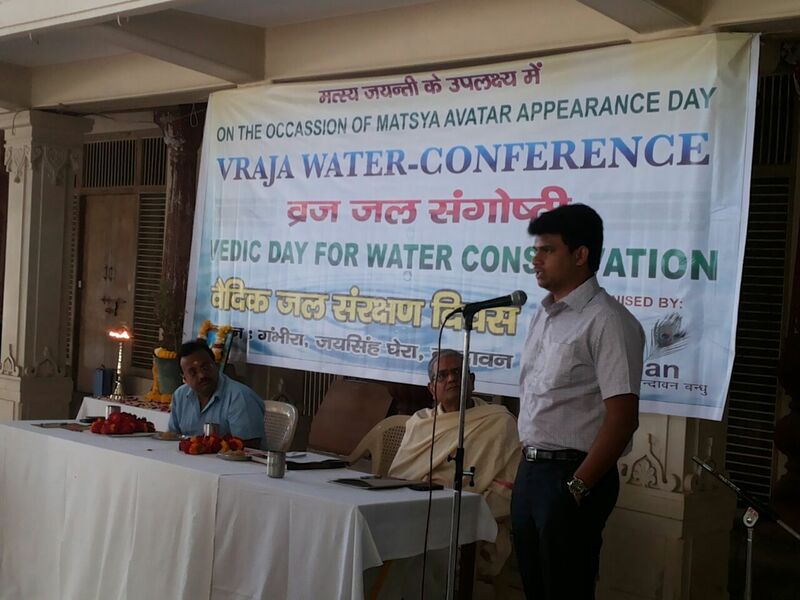 March 23, 2015: In a unique move Friends of Vrindavan celebrated the appearance day of the Matsya Avatar by organizing ‘Vraja water- conference’. The occasion coincided with the International Day for water conservation or the World Water Day. More than fifty activists participated in the conference which deliberated on the impending water crisis in the region and adopted a Vrindavan declaration listing 20 demands, including one that calls for fair sharing of Yamuna water by cities downstream of the hathini Kund barrage in Haryana. The speakers raised different water issues in the conference in front of the Chief Development Officer of the Mathura, who represented the Mathura District Administration. In his inaugural address, His Holiness Acharya Shrivatsa Goswami ji Maharaj narrated, “There is a scientific reason for celebrating the water day on the appearance day of the Matsya Avatar. Matsya is believed to symbolize the first stage of evolution, as aquatic life was the first being on earth. Fish is the symbol of transformation and creation. This is observed in the ancient history in which Vishnu transformed himself into a fish (Matsya) to save the world from a great flood. In this form, he guided king Manu’s boat (which contained selected few survivors & seed of life to re –create the world after the flood subsided to safety. All the varieties of seeds, the seven saints, along with the serpent Vasuki and other animals were taken on the boat. The boat of Manu only sailed and rest of the world submerged in the water. The Lord himself pulled the boat. 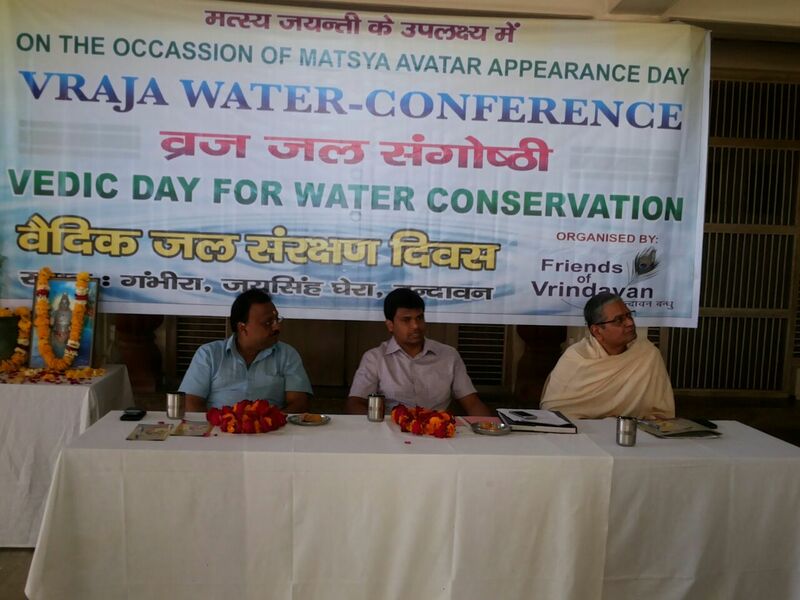 Thus Matsya Avatar also stood for the seed conservation also along with the water conservation”. He pointed out that it had been a practice in many places that new fish was put in water bodies during the auspicious occasion. He further added that Vraja had numerous water bodies. There were fifty two kunds only in Nandgaon as Nanda Baba needed several water bodies to cater water for his big number of cows. Acharya Naresh Narayan expressed his concern about the water scarcity in Vraja. He said that this region was once known for its holy “kunds” (ponds) and numerous water bodies amidst dense forest is struggling for the water. He suggested that the ghats of the Yamuna should be restored, besides clearing all drains of untreated effluents and sewer into the river. Shri Shravan Kumar from the Braj Mandal heritage conservation society demanded the demarcation of the Yamuna’s flood plain boundary, while Madhumangal Shukla from the Braj Vrindavan Heritage Alliance demanded the demolishment of the encroachment on the Yamuna Flood plain. Dr. Laxmi Gautam sought war like efforts to dredge and de-silt the Yamuna river bed to increase its holding capacity and open up the choked aquifers that prevented percolation of water. Addressing the conference, the Chief Development Officer of Mathura Shri Andra Vamsi said along with efforts being by the government agencies, the local populations of the towns of Mathura and Vrindavan must also come forward and share the responsibility of keeping the river. “Give me 500 volunteers and I will myself pick up the broom to clean up the mess,” he promised. It was unanimously resolved that a ‘shram-daan’ programme will be organized to clear the ghats from the debris on the bank of the Yamuna. The CDO promised his participation in the ghat clearing activity. 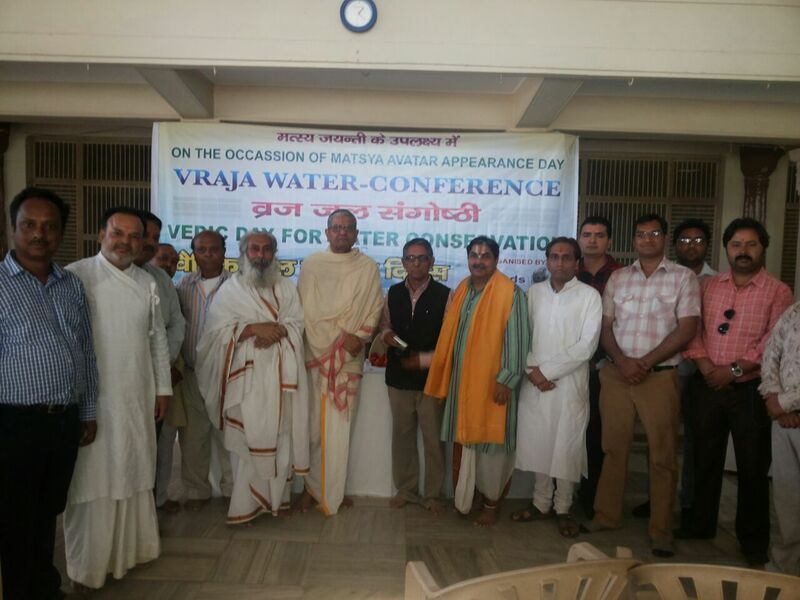 Dr. Chandra Prakash Sharma, Shri Vikram Bhuwalka, Ram Narayan Brajwasi, Dhananjaya Gautam, Madan Gopal Banerjee, Dan Bihari Sharma, Go sevak Alok, Shri Vraj Khandelwal, Swami Sushilananda, Sushil Sharma etc also spoke on the various water issues of Vraja. This entry was posted in conference / meeting. Bookmark the permalink.